Separation operations are crucial throughout the process industry with respect to energy consumption, contribution to investments and ability to achieve the desired product with the right specifications. 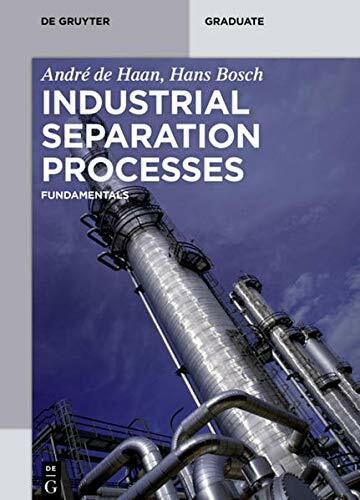 Our main objective in creating thisgraduate level textbook is to present an overview of the fundamentals underlying the most frequently used industrial separation methods. We focus on their physical principles and the basic computation methods that are required to assess their technical and economical feasibility. The textbook is organized into three main parts. Separation processes for homogeneous mixtures are treated in the parts on equilibrium based molecular separations and rate-controlled molecular separations. The part on mechanical separation technology presents an overview of the most important techniques for heterogeneous mixture separation. Each chapter provides a condensed overview of the most commonly used equipment types. The textbook is concluded with a final chapter on the main considerations in selecting an appropriate separation process for a separation task. As the design of separation processes can only be learned by doing, we have included exercises at the end of each chapter. Short answers are given at the end of this book; detailed solutions are given in a separate solution manual. Andre B. de Haan, Eindhoven University of Technology, Eindhoven, The Netherlands; Hans Bosch, University of Twente, Enschede, The Netherlands.